(Colombo) REUTERS: The European Union will consider stripping Sri Lanka of its duty-free access if it backs off commitments on rights, the EU ambassador said, amid worries stoked by the President’s replacing of the elected premier by a wartime nationalist. 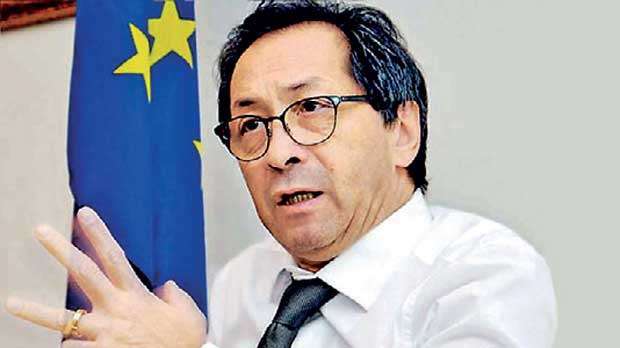 “The government got GSP on the basis of certain commitments, if these commitments are not met, then we would consider withdrawal,” EU ambassador to Sri Lanka, Tung-Lai Margue told Reuters on Thursday. Margue said some progress had been made towards human rights by the administration of sacked Prime Minister Ranil Wickremesinghe, such as the establishment of a missing persons’ office to trace the thousands of Tamils and minority Muslims who disappeared during the war. Rajapaksa was not available for comment yesterday. Soon after he was appointed Prime Minister on Oct. 26 he said he would work to end political and ethnic divisions and “eschew the politics of hate”, protect human rights and the independence of the judiciary and establish law and order”. The speaker of parliament said yesterday Sirisena had agreed to summon a session on Wednesday next week. The EU warning on trade is the strongest yet from Western powers which, along with India, the island’s nearest neighbour, have urged Sirisena to abide by the constitution. On the other hand, China, which invested billions of dollars during Rajapaksa’s presidency, has called for non-interference and said Sri Lanka could tackle its own problems. Sri Lanka regained the GSP plus preferential treatment in 2017. Its exports to the EU have since jumped 18 percent, and the financial year was not yet over, Margue said. Fish exports had jumped 100 percent, he said. Sri Lanka’s garment industry is its second-biggest hard currency earner, after remittances, worth about US$5 billion a year, with goods supplied to top brands including Victoria’s Secret, Tommy Hilfiger, Nike and Marks & Spencer.